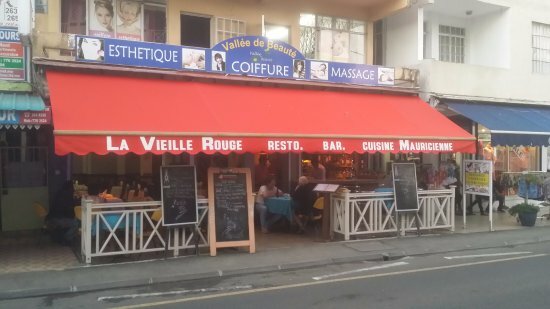 La Vieille Rouge is a popular Chinese sea food restaurant located in Grand Baie. It is a small restaurant but you can get good Mauritian, Chinese and French food there at reasonable prices. Menu is a combination of local catch and imported meat, fish and vegetarian. You’ll find a standard selection of Creole curries, Chinese dishes, fresh fish and so forth. Their specialty is authentic Mauritian style Rougaille, Currys and vindaye. You can order local wines to accompany your food which are very reasonable. The menu selection is not huge but the quality of food & services is good. You can also enjoy live music along with your meals played by duo of musicians. Unfortunately they will not accompany your meals on Thursday. This is a small budget eating joint which you can dine at if you are just passing by and want a quick bite.